Home Automation is the biggest domestic technological improvement of this generation, toe to toe with drones. It can provide full control of every piece of hardware in a house, if done well: from light control to preparing coffee at a specific hour of the day, key-less doors to automatic plant irrigation. There’s truly no limit to Homes Automation, and with such a powerful board as the MKR1000, which itself resolves the WIFI issue, it becomes straightforward to connect an Android device and use it to control the lights, for example. Furthermore, using wifi over Bluetooth for this project overcomes the limitation of the Bluetooth range issue. The MYO is a gesture control armband that detects EMS data from the muscles in the users arm, therefore it can detect poses he does with his hands, plus it has a built-in accelerometer, which extends the possibilities of control to a great extent. With this sort of technology, there is no need of using your smartphone, just finger spread your hand and voilà: lights turn on and off thanks to it. Wave right twice, once left, double tap your thumb with your middle finger and voilà again, the door unlocks, Jedi style. With this feature, the projects upgrades from Home Automation to Gesture Controlled Home Automation. But then again, why stop there? In such a world of DIY and constant improving technology, why limit this project to Home Automation if we can turn it into a Gestured Controlled Smart Home project. 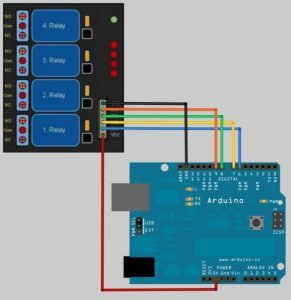 The arduino MKR1000 keeps track of each user connected to it’s server, therefore, before even entering the house, one could already know who’s already home, and if so, what they are doing. Smart Homes aren’t only about controlling hardware through digital medias such as computers and smartphones, it’s also about knowing what’s going on inside the users house even before he enters it. It’s about simplifying our daily domestic life. Last but not least, this concept could have also infinitive uses in the workplace. For instance, during a power point presentation or a business meeting, having this technology to control the lights of the room, the air conditioning, opening the electronic curtains, etc, could prevent the distraction of your audience and clients. This technology has the advantage of allowing discrete control of a room features (with minimal disruption), keeping your audience and clients focus on what truly matters to your company or organisation! 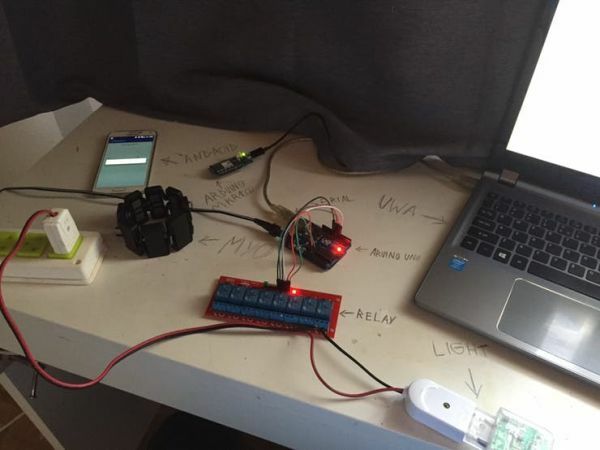 The arduino MKR1000 has an on-board wifi shield that allows other wifi devices to communicate with it, therefore we’re able to use a smartphone or compute to control the hardware connected to the relay. Then, we can connect the MYO to the smartphone through Bluetooth. the same application that sends the commands to the arduino will also listen to the MYO, which itself is reading the EMG (electromyography) data of the user’s arm and, after detecting a valid hand pose(fist, finger spread, wave in, wave out, double tap) it sends the message to the android application. 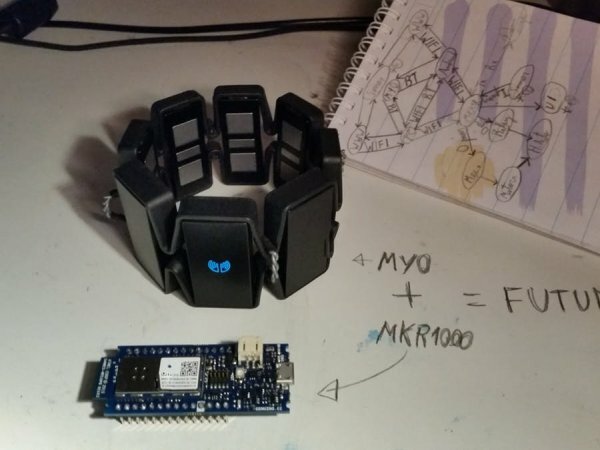 Once the MYO detects the finger spread pose, the app receives the data and resends it to the arduino through a UDP message to the MKR1000. The arduino MKR1000 sends the data through serial communication to a UWA running on the computer. 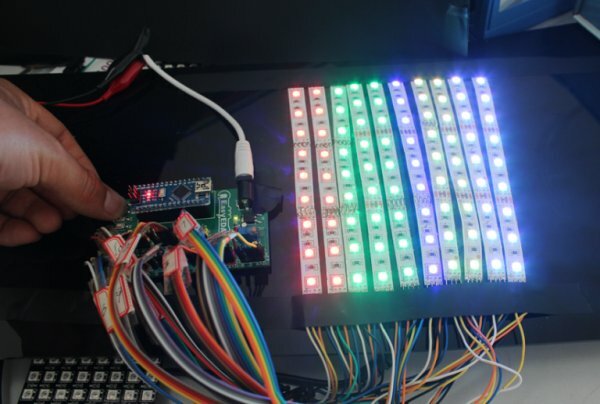 This last analyses the data and resends it to an Arduino Uno, which has a relay connected and therefore is able to control the lights and other pieces of hardware in the house. When the user does a fist pose, the same process takes place, but instead of turning it on, the component turns off. The advantages of using an extra Arduino is that we are able to use more pins to control more hardware, considering the limit number of pins in the MKR1000. I am still working on a Windows 10 application to also be able to control the house and be part of the project. It will be more like a hub for every user in the environment where the project would be used. As soon as i finish it, i will upload the code. NB: I didn’t upload a video showing the actual light and other components of the house control because i was missing a relay, as soon as it arrives, i will upload another video. 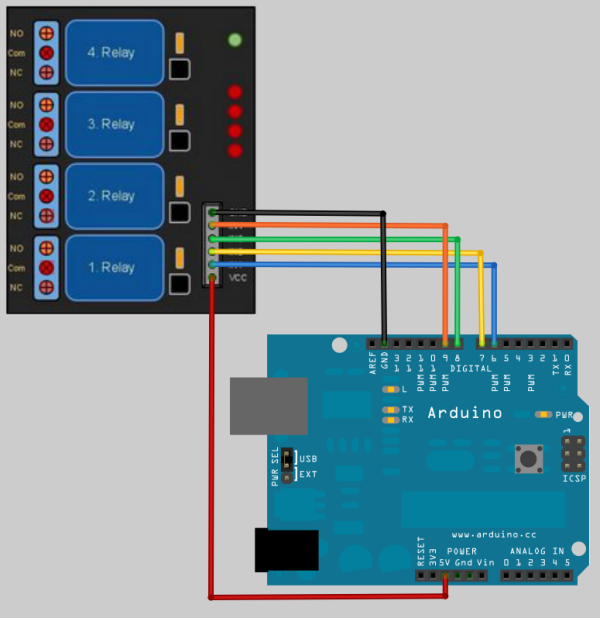 There is no arduino MKR1000 model in fritzing, but the pins used in this image are the same, and the connections also. // Disable standard Myo locking policy. All poses will be delivered. // Next, register for DeviceListener callbacks. // Finally, scan for Myo devices and connect to the first one found that is very near. // Create a datagram socket, send the packet through it, close it.